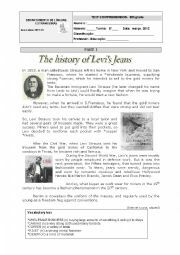 A fashion-related test for 8th graders with vocabulary on the topic and the passive voice. This text was adapted and abridged from several internet data. 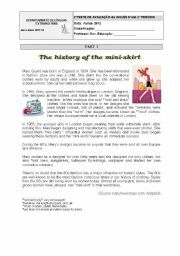 It intends to be a simple revision worksheet before the test about the History of the mini-skirt. It is a Text Reading and Comprehension worksheet, which can also be used as the first part of a written test. Thank you. 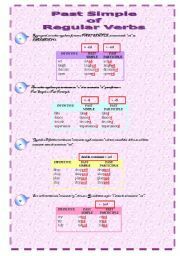 This is just a table explaining the usage and differences concerning the three main types of conditional sentences, suitable for pre-intermediate level. The exercises will follow in another worksheet due to the usual size problems...! I hope it is as useful for you as it was for my students. Thank you! The second of a series of three. These verbs have been grouped into SOUND CATEGORIES or spelling.Rather funny for a drilling activity, followed by written practise.Rythm also plays an important role. My younger students say "verbs aren´t that difficult, after all. But rather fun."Enjoy! The last of a series of three. The verbs have been grouped into SOUND CATEGORIES or spelling.Rather funny for a drilling activity, followed by written practice.Rythm also plays an important role. My younger students say "verbs aren´t that difficult, after all1" I hope it is useful for you.Have fun! 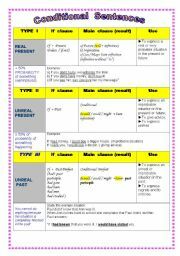 An introductory ppt to irregular adjectives with another page with exercises and appealling pictures! Click and the answer appears! I have other ppts, but the size is the problem... I´m working on that. Enjoy!